Tanya Ward Goodman writes with clear-eyed, simple elegance as she tells the tender story of a special father-daughter bond nurtured at traveling carnivals and county fairs, and cemented with the thousands of bottles that make up the exterior walls of Tinkertown—the family’s home and oddball museum in Sandia Crest, just northeast of Albuquerque. 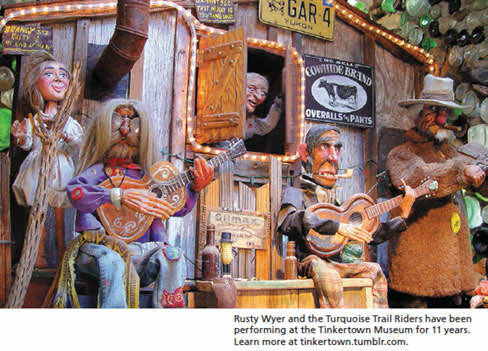 Tinkertown is New Mexico’s version of that peculiar fringe of Americana known in the mid-20th century as the roadside attraction. Whether it’s Reverend Howard Finster’s Paradise Garden, in Georgia, or Dr. Niblack’s Wood-Carving Museum, in South Dakota, the aesthetic is the same: creatively eccentric folk art of the most unusual kind, generally helmed by a singularly and obsessively talented individual. Goodman’s father, Ross Ward, was such a character; his love of the roadside attraction was born on a childhood visit to Knott’s Berry Farm in the 1940s. He grew up to be a carnival painter, traveling the country’s back roads while dreaming of having his own museum to house his growing collection of his own hand-carved miniature circus dioramas, as well as dozens of wedding-cake toppers, souvenir bullet pencils, old hand tools, and the other flotsam and jetsam his breed of collectors tends to accumulate. In the 1970s, he moved his exhibits from the New Mexico State Fair to a permanent installation in the family’s small house in Sandia Park, off N.M. 14—a house that began growing along with Ward’s collections. Ward Goodman reveals her remarkable childhood in Tink-ertown almost casually, as the story she really wants to tell is not her own but that of her intensely talented and passionate father, whose life began unraveling at the age of 58, when he was diagnosed with early-onset Alzheimer’s disease. Doctors told him—and the family—to expect about five years of steady, predictable, heartbreaking decline. Although struggling to build a Hollywood writing career, and newly in love with the man she would eventually marry, Ward Goodman, at 28, made the painful decision to return to Tinkertown to be with her father while he was still in reasonably good shape, and to take care of him as he slowly faded away. She writes of battles with her controlling stepmother balanced by quiet visits with her mother, who sequestered herself at the edges of the family drama. There are moments of Ross’s lucidity that shine brightly amid the dross of his declining health. There is a museum to run, a long-distance relationship receding into the ether, and a growing awareness of Ward Goodman’s own fragility as self-care is lost amid the heavy lifting required of caretakers. Through it all, Ward Goodman writes with well-modulated reflection. In short, poignant chapters that capture the essence of her relationship with Ross and the magnitude of her loss, she eventually comes to the realization that, just as “the show must go on” at Tinkertown, so must she also come out from under its shadow and move on with her own life. In Portland-based author Karen Karbo’s biographies, including the light-footed How Georgia Became O’Keeffe, you don’t find the morose idol worship or relentless catalogues of detail that plague the genre. This latest in Karbo’s series makes an easy read for anyone interested in the life of the woman behind the O’Keeffe legend. Karbo’s biography reveals how O’Keeffe’s extraordinary life embodies wisdom about how to live authentically that can be gleaned by more ordinary mortals like us. While the book offers the traditional biographical fare, How Georgia Became O’Keeffe also serves up some helpful bits of advice derived from O’Keeffe’s own choices, which allowed her cultivate her talent and build her formidable oeuvre. The book’s 10 chapters are titled and based on 10 action verbs that Karbo identifies as crucial to O’Keeffe’s unique lifestyle and success: defy, grow, adopt, muddle, embrace, bare, rebel, drive, break, prize. Only in the later, Land of Enchantment chapters of the book—“Drive,” “Break,” “Prize”—do we see O’Keeffe really hit her stride. Eventually taking up solitary residence at Ghost Ranch, 16 miles down a dirt road from the nearest phone in Abiquiú, O’Keeffe did just as she pleased in New Mexico, including letting her husband fend for himself back in New York. She learned to drive a car, collected cow skulls, and painted adobe buildings, striated mesas, and surreal blue skies to her heart’s content. Josephine Buck, a Diné woman who lives near Farmington, takes night classes, works part-time at a trading post, and is also in training to be a medicine woman. Right smack dab into the life of this busy 26-year-old falls a murder and, in suspenseful succession, the attendant cops, gumshoes, spottings of suspicious cars, and clues. Page-turning mysteries are a dime a dozen, but this one is deftly interwoven with Navajo spirituality, northwestern New Mexico landscape, and cowboy culture. Co-author David Thurlo grew up on a Diné reservation, and his knowledge base is evident throughout the narrative. Husband-and-wife team David and Aimée Thurlo live in Corrales. This is their 29th book.